Anyone who’s played Tetris can cram clothes into a carry-on bag. The real challenge for business travelers is preventing their clothing from looking like it's been sitting in a gym bag for six months. While the Fairfield Inn & Suites by Marriott can do everything from dry clean your suits to wake you up in the morning, you're on your own when it comes to packing your bags. Use these packing tips the next time you're expected to look like a presentable human adult after a long journey. When it comes to packing, the smallest items can leave travelers the most stupefied. Necklaces are known to get tangled together, while cufflinks and earrings often get lost in the folds of suitcases. From rings to watches, a simple pillbox can solve all these problems, and it won’t take up much space in your suitcase. If you’re traveling with the Hope Diamond or something equally precious, wear it during your travels to reduce the risk of loss or theft — or better yet, leave it at home. 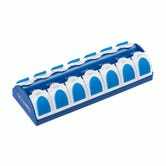 Even if you don’t wear contacts, lens cases with screw-on lids are a great tool for transporting liquids. When it comes to hair gel, makeup remover, or essential oils, all you need is a little dab — and each section of a contact case can contain several days' worth of pomade or whatever you're into. If contact cases don’t afford enough room, use an empty pill bottle. They're the perfect size for transporting your favorite shampoo and conditioner (a necessity, if you're trying to protect a dye job or prevent a dandruff disaster). Not only do most bottles exceed the quantity of liquids allowed in checked bags, but many are fragile enough to put the entire contents of your bag in jeopardy. The last thing you want to do is arrive at a client’s office smelling like a teenage boy after soccer practice. Frequent travelers should fill up an atomizer or compact spray bottle with their fragrance of choice. The secure bottles don’t defy the TSA’s three-ounce rule and can easily be thrown into a bag or purse for a quick spruce-up throughout the trip. Whether you want to safeguard your shoes from scuffs or protect your clothes from dirty shoes, the shower cap on your hotel room vanity can help. (See, it is good for something!) Use it in place of a plastic bag to add a protective layer between your shoes and the rest of your bag. It’s a good idea to make space wherever you can find it, so packing chargers, socks and other small items inside your shoes can help. If you’re worried about hygiene, enclose these items in a plastic bag (or shower cap) first. Women traveling with high heels can also nestle socks around each shoe’s heel to avoid damage without sacrificing any space. Rumpled clothes are a real turn-off in the business world, and the last thing anyone wants to do right when they land is pull out an iron to fix a shirt collar. But an overstuffed bag could cause that little plastic piece in a dress shirt collar — known as the “collar bone” — to get crunched. 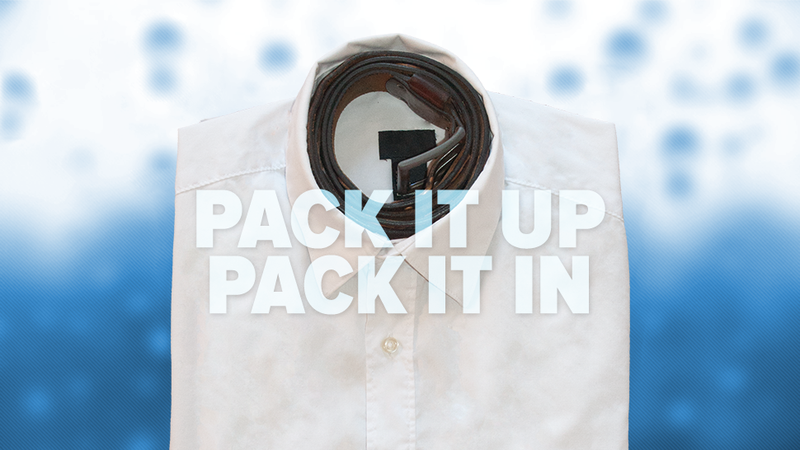 Here’s a simple tip: After folding your shirt, coil your belt in a circle so it fits inside the collar. Voila! Now you’ll have at least one crisp shirt to wear when arriving at your destination. Why spend your first hour of hotel room bliss ironing clothes when you could be taking a leisurely dip by the pool, instead? Make the most of your business trip by staying with Fairfield Inn & Suites by Marriott. And check the Business Traveler's Toolkit for more helpful travel tips.